We could learn a lot, both about life and literature, from this 1882 novella by the Brazilian writer Joaquim Maria Machado de Assis. Machado is only now becoming prominent in the Anglophone world with Liveright's publication last year of his collected short stories (in which another translation of The Alienist appears; I read the 1963 version by William L. Grossmann—the first in English—as reprinted by Melville House). We are currently more aware both of his significance for Latin American letters and of the praise he has already received from English-language authors. 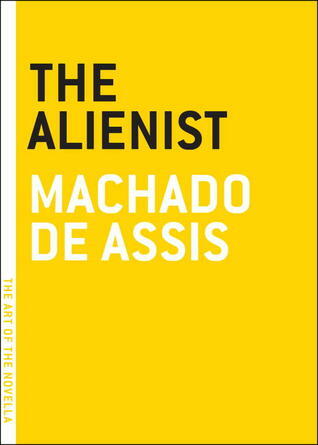 Though Machado is credited with bringing literary realism to Brazil, I was reminded for my part of Voltaire by the novella's slapstick briskness of narration and arch appraisal of human delusion; Jensen's evocations of Cervantes and Kafka, however, catch the pre- and post-Enlightenment undertone of despair over human incorrigibility that sounds at The Alienist's close. At 80-some pages, The Alienist is a little epic of revolution and counter-revolution, a little tragedy of one man's fall from overweening ambition to final self-defeat, and a grand satire, eventually on everyone and everything. The story begins when the brilliant, European-educated physician, the eponymous psychologist Simão Barcamarte, decides, at the age of 34, to return to his provincial Brazilian home town of Itaguaí. There, and with the support of a local government grateful for his modernization effort, he opens the region's first asylum and, driven by pure scientific curiosity, determines to find the causes of and discover the treatments for mental illness. A rationalist, he marries a vain woman he hardly cares for because he deems her physiology (blood pressure, eyesight, etc.) promising for his progeny and claims that her charmlessness will leave him undistracted from his scientific work. "Till now, madness has been thought a small island in an ocean of sanity. I am beginning to suspect that is not an island at all but a continent." This incarceration of the populace provokes a revolution led by the barber Porfírio; but the new government, once installed, decides to work with Barcamarte instead of fighting him, and the previous government is restored in the end. This satire on populism, revolution, and governmental inertia suggests Machado's political cynicism: while Porfírio, pleased with his own grandiose phraseology, proposes storming the "Bastille of human reason," other fine phrases find their own constituencies, and revolution inevitably comes full circle. Simão Barcamarte...had found in himself the perfect, undeniable case of insanity. He possessed wisdom, patience, tolerance, truthfulness, loyalty, and moral fortitude—all qualities that go to make an utter madman. First, life. Today we encounter an almost unprecedented faith in the medical model of the psyche. Individuals accept, and institutions increasingly not only accommodate but demand, fundamental identification based on labels devised by physicians. That these labels are themselves often tropes, names for lists of symptoms, and that their sometimes pharmacological treatments might conduce more to the profits of corporations than people—these are observations I almost hesitate to type, so concealed are they behind a moralized rhetoric of "help" and "care." And while I certainly don't mean to belittle the necessity of medical intervention for certain mental problems, I find The Alienist prophetic, especially as it was written before even the advent of psychoanalysis. Anticipating 20th-century enemies of totalizing psychology from Woolf and Nabokov to Pynchon and Foucault, Machado satirizes the arbitrariness and authoritarianism of psychological classification and queries the motives, even the sanity, of those who would presume to sit in judgment on human reason. In so doing, he speaks to the 21st century. Both Machado and Barcamarte are disinterested. This word is now lazily used as a synonym for boredom, but it properly denotes the ideal impartiality of the scientist and the artist. Like every other ideal, it is not humanly achievable, but neither is it to be abandoned. Its mark in this text is the narrator's dispassionate storytelling, a quality of withholding and understatement that allows the reader to feel the tragic finale to this ironic tale more than any authorial emoting would have. As Namwali Serpell notes in her polemic on "The Banality of Empathy," we may need less sentimentality in our fiction and more of the cognitive capacity to recreate viewpoints and attitudes, all the better to perceive both their potentials and their limitations. Here, too, Machado shows the way. Sign into Goodreads to see if any of your friends have read The Alienist.